Unless I'm out for drinks, I'm a tote girl--with shoulder straps (it makes shopping easier, and I like to have all my little creature comforts availabe: bottle of water, small makeup bag with essentials, phone & ipod touch, etc). 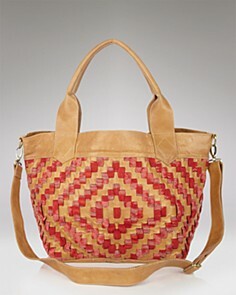 I'm dazzled by this tote's patterns, variety of textures, and dimensionality. Although I'd wear it sans crossbody strap, it does offer that as an option. Not familiar with Cleobella?Get a taste of this ecclectic label with bohemian flare by checking out the rest of Cleobella at Bloomingdale's or Cleobella's online destination.